For other artists with the same name, see Lee Min Ho. Family: Father, mother, and older sister Lee Yong Jung (MYM Entertainment CEO). 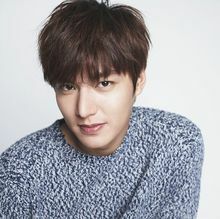 Lee Min Ho was born in Heukseok-dong, Dongjak-Gu, Seoul, South Korea on June 22, 1987. In his youth, he had aspired to be a soccer player and dedicated himself fully to the sport in elementary school. A fifth-grade primary school injury prevented him from making that dream a reality. He then started to be interested in pursuing another dream of his, acting. In his last year of high school he signed with Starhaus Entertainment, in part through the help of a friend. He was trained by the agency for two years and then started auditioning for a series of small roles in television series. He thus began to gain traction in the industry. Hobbies: Watching movies, playing video games, and recreational sports. This page was last edited on 3 February 2019, at 12:41.